What’s up, friends and fans of the Oklahoma Sooners? I hope you all had a nice Labor Day Weekend full of college football! Before I dive into more of what took place on the field, there is a bit of news happening off the field that involves Oklahoma and Ohio State. OSU has filed a Trademark Trial and Appeal Board action against OU regarding the block letter ‘O’ logo used within another logo of the Pride of Oklahoma drum major. The standalone ‘O’ logo shown below is not used on the actual drum major’s uniform at this point, as the current uniform has “OKLAHOMA” in the foreground. Oklahoma asserts their block ‘O’ has been in use since 2001, but Ohio State claims their block ‘O’ has been around since as early as 1898. As it stands, the University of Oklahoma must address The Ohio State University’s claim of infringement and dilution by October 8th. As far as this is concerned, we can let them think it belongs to them. We already know who truly owns it. Now that we’ve given Baker Mayfield his mention for the day, let’s dive into the links! Austin Kendall’s injury doesn’t appear too serious, Oklahoma is Bill Connelly’s team of the week, Tiger Woods has a look-a-like that looks a lot like Tiger Woods and more! With Austin Kendall possibly out for the next week or so, the backup duties will be granted to one of two Tanners: Schafer or Mordecai. Both have minimal experience on the field, but in what little reps they’ve had, both seem capable of managing the offense should the situation arise. Riley also talked about the Sooners’ running game. A deep and versatile collection of backs running within ingenious schemes gives Oklahoma one of the more effective run games in the nation. Riley also remarked on the early kickoff times, expressing his disdain for the number of early starts in succession. One of the primary reasons why he is not in favor of them is from a recruiting standpoint. 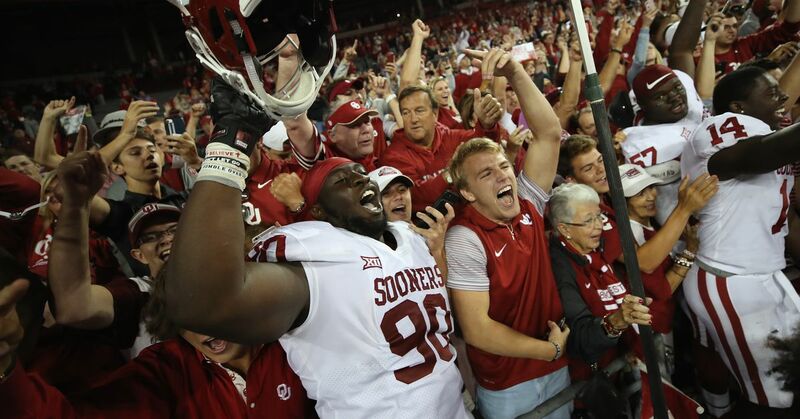 There were plenty of impressive performances over the weekend in college football, but Bill Connelly says Oklahoma’s beatdown of FAU made the Sooners his top team of the week. On Monday, senior linebacker Curtis Bolton was named Big 12 Defensive Player of the Week for his standout performance on Saturday. Congrats, Buzzy! Now that college football’s Week 1 is completely in the books, what are some of the biggest overreactions and hottest takes imaginable with the smallest of sample sizes? If college football teams owned and took over land other teams owned by beating them on the field, what would a map of such a reality look like? The Labor Day Weekend finale saw Virginia Tech stroll into Tallahassee and shut down the Florida State Seminoles. Hokies fans in attendance had a lot of fun at FSU’s expense, and even did the war chant and Tomahawk Chop to mock the ‘Noles. Now that’s cold. This happened at the U.S. Open on Monday, and honestly I don’t know what to say. I know some people dip fries in their Frosty, but this is just too next-level for my understanding. Tiger Woods has a doppelganger who has been following him around and posing for pictures with the spectators. Is that you, Lion Forest? Fortnite has swept the nation and quite frankly gamers worldwide, and many parents are now coming together in support groups to learn more about the game and the obsession their children have with it. Honestly I’m just impressed it’s sustained its popularity for this long, considering the simplicity of its concept.